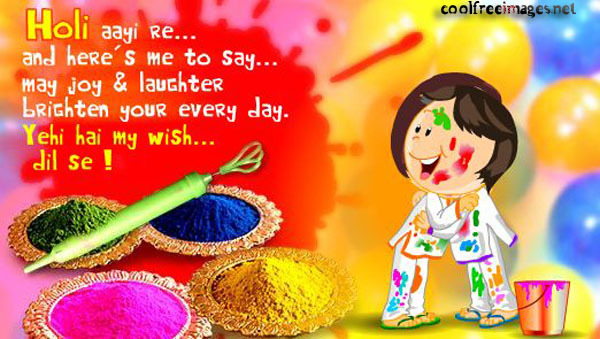 I couldnt find a topic about Holi so I would like to wish all of u Shubh Holi. I wish you all loads of happiness and joy in this special season! May you and your family have a blessed and safe Holi! Holi - the festival of colors - is undoubtedly the most fun-filled and boisterous of Hindu festivals. It's an occasion that brings in unadulterated joy and mirth, fun and play, music and dance, and, of course, lots of bright colors! It is primarily observed in India, Nepal, Sri Lanka and countries with large Indic diaspora populations. The most celebrated Holi is that of the Braj region, in locations connected to Shri Krishna: Mathura, Vrindavan, Nandagaon, and Barsana. With winter neatly tucked up in the attic, it's time to come out of our cocoons and enjoy this spring festival. Every year it is celebrated on the day after the full moon in early March and glorifies good harvest and fertility of the land. It is also time for spring harvest. The new crop refills the stores in every household and perhaps such abundance accounts for the riotous merriment during Holi. This also explains the other names of this celebration - 'Vasant Mahotsava' and 'Kama Mahotsava'. The main day, Holi, also known as Dhuli Vandana in Sanskrit, also Dhulheti, Dhulandi or Dhulendi, is celebrated by people throwing coloured powder and coloured water at each other. Bonfires are lit the day before, also known as Holika Dahan (burning of Holika) or Chhoti Holi (little Holi). The bonfires are lit in memory of the miraculous escape that young Prahlad accomplished when Demoness Holika, sister of Hiranyakashipu, carried him into the fire. Holika was burnt but Prahlad, a staunch devotee of Shri Vishnu, escaped without any injuries due to his unshakable devotion. Holika Dahan is referred to as Kama Dahanam in South India. Hiranyakashipu is the great king of demons, and he had been granted a boon by Brahma, which made it almost impossible for him to be killed. The boon was due to his long penance, after which he had demanded that he not be killed "during day or night; inside the home or outside, not on earth or in the sky; neither by a man nor an animal; neither by astra nor by shastra". Consequently, he grew arrogant and attacked the Heavens and the Earth. He demanded that people stop worshipping Gods and start praying him. Despite this, Hiranyakashipu's own son, Prahlada, was a devotee of Lord Vishnu. In spite of several threats from Hiranyakashipu, Prahlada continued offering prayers to Lord Vishnu. He was poisoned but the poison turned to nectar in his mouth. He was ordered to be trampled by elephants yet remained unharmed. He was put in a room with hungry, poisonous snakes and survived. All of Hiranyakashipu's attempts to kill his son failed. Finally, he ordered young Prahlada to sit on a pyre on the lap of his demoness sister, Holika, who could not die because she also had a boon which would prevent fire from burning her. Prahlada readily accepted his father's orders, and prayed to Vishnu to keep him safe. When the fire started, everyone watched in amazement as Holika burnt to death, while Prahlada survived unharmed, the burning of Holika is celebrated as Holi. Later Lord Vishnu came in the form of Shri Narasimha (who is half-man and half-lion) and killed Hiranyakashipu at dusk (which was neither day nor night), on the steps of the porch of his house (which was neither inside the house nor outside) by restraining him on his lap (which is neither in the sky nor on the earth) and mauling him with his claws (which are neither astra nor shastra). In Vrindavan and Mathura, where Lord Krishna grew up, the festival is celebrated for 16 days (until Rangpanchmi) in commemoration of the divine love of Radha for Krishna. Lord Krishna is believed to have popularized the festival by playing pranks on the gopis here. Krishna is believed to have complained to his mother about the contrast between his dark skin complexion and Radha's (Shakti or energy that drives the world) fair skin complexion. Krishna's mother decided to apply colour to Radha's face. The celebrations officially usher in spring, the celebrated season of love. There is alternative story detailing the origin of Holi. This story is about Kamadeva, a god of love. Kama's body was destroyed when he shot his weapon at Shiva in order to disrupt his meditation and help Parvati to marry Shiva. Shiva then opened his third eye, the gaze of which was so powerful that Kama's body was reduced to ashes. For the sake of Kama's wife Rati (passion), Shiva restored him, but only as a mental image, representing the true emotional and spiritual state of love rather than physical lust. The Holi bonfire is believed to be celebrated in commemoration of this event.